REDDING, Calif. – For 47-year-old Letty Garza of Weaverville, earning her degree from Simpson University fulfilled one of her lifelong dreams. The single mother of a 12-year-old daughter graduated Saturday from Simpson University's ASPIRE program with a degree in organizational leadership. The university's spring commencement, held on April 30, graduated 206 students, including 126 from traditional undergraduate studies, 50 from the Adult Studies (ASPIRE) program, eight from A.W. Tozer Theological Seminary, and 13 from the School of Education. "As a single mom, ASPIRE offered me a convenient weekend format that made it easy for me to earn my degree," said Garza, who works for Trinity County's Health and Human Services. Garza's daughter, Victoria, watched her graduate along with other family members from the San Joaquin area. "My daughter was a good supporter while I was in ASPIRE," she said. "She would quiz me on information to help prepare me for exams, and she'd let me practice my Power Point presentations with her." While the ASPIRE program has seen an increase of adults returning to school so they can stay competitive in the job market, Garza's reason for earning her college degree stems from a dream she had postponed for several years. "I've always had the desire to earn a college degree," she said. "I enjoy learning, and I wanted to grow personally and professionally. ASPIRE professors had positive things to say about Garza. Adjunct Professor Mike Borgaard said she often went above and beyond. "Letty set a very positive tone in the classroom," he said. "She was enthusiastic, prepared and collaborative, and distinguished herself as an excellent student." Garza has been a full-time deputy director for Health and Human Services for eight years and says her degree will help her be a more effective manager. "I feel very appreciative to the ASPIRE program," she said. "It's great for single parents." 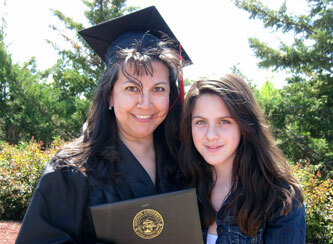 Garza is the youngest of nine children and the first in her family to graduate from college.